Gain access to the largest and most complete line of artificial grass products in the industry. Is Your Turf Warranty Sending You Warning Signals? When you're buying artificial grass, you want to make sure that your product will last for years to come. How Much Artificial Grass Costs? There are many great reasons to install an artificial grass lawn. Estimate costs of turf and installation with our famous online calculator. Artificial grass is our specialty. We manufacture the best-rated turf products in the United States. Our expansive catalog includes the finest selection of landscape grass, putting greens, agility training turf, indoor and outdoor decks and patio mats and rugs of custom sizes! Choose from more than 75 grass products offered by Global Syn-Turf to turn your lawn or golf course into always green no-maintenance safe field made from the highest quality latest generation fiber that fits any shape and budget. From residential and commercial landscape lawns, public parks, playgrounds, and apartment buildings to golf practice putting greens for golf courses and in-home applications, to the specific pets projects, dog runs, hotels and clinics, backyard turf for dogs, turf mats and rugs for roofs, patio and decks, Global Syn-Turf supplies more than 150 million square feet of turf annually. Choose synthetic turf of any height, face weight and color to organically blend with your local environment and add the green, healthy luxurious look to any area you have in mind. Our artificial grass withstands heavy traffic, high wear, and tear, undergone vigorous testing and meets federal and local governmental requirements. Global Syn-Turf makes it easy to find and install water-efficient lawns that can help your wallet and the environment. GST-labeled products are back by independent, third-party testing and certification, and meet EPA's specifications for water efficiency and performance. When you install synthetic lawn on your property, you can expect exceptional performance backed by 15-year's manufacturer's warranty with twenty years life-span expectancy, significant savings on your water bills, and assurance that you are saving water for future generations. 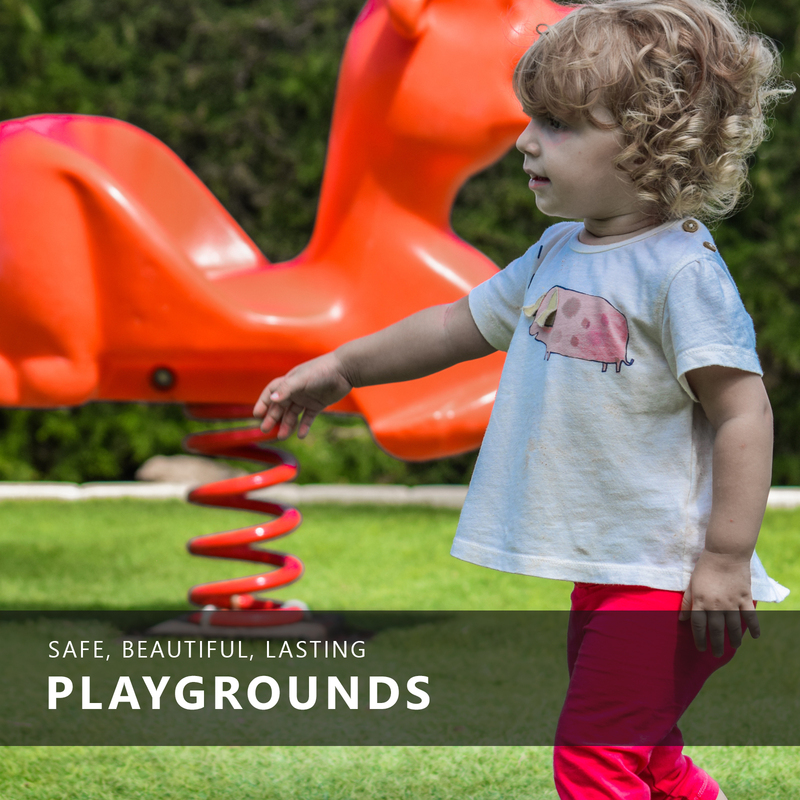 Global Syn-Turf playground turf dramatically decreases the need for ongoing maintenance and provides the safest, risk-free field for playgrounds, indoor & outdoor play areas. Synthetic turf used under play equipment has several advantages over rubber surfaces. It stays in place, easy to clean, has consistent impact-absorbing qualities. It isn't flammable, doesn't fade or discolor, does not harden, brittle or crack, non-toxic and wheelchair accessible. Liquids drain quickly through the turf surface creating dry, slip-resistant flooring for children reducing risks of fall injuries. With 20 years lifespan expectancy and beautiful realistic look of natural turf lawn, synthetic grass surfaces supersede its competitors. Global Syn-Turf surfacing choices offer maximum flexibility and a wide range of options. Our certified installers will help you get your project up and dash starting with site work, grading, and safety surfacing installation. Our synthetic grass is installed on thousands of play spaces nationwide. Decide to work with Global Syn-Turf and choose to make the process fast, easy and professional. We are proud to offer the best quality park and playground surface systems to meets specific needs, budget, and regional safety requirements. Create your private dream golf course in the comfort of your backyard. Global Syn-Turf putting greens offer practice anytime, anywhere, indoor or outdoor. Our golf greens, made of top materials under strict quality control standards, offer real golf experience & performance for amateur and professional golfers. 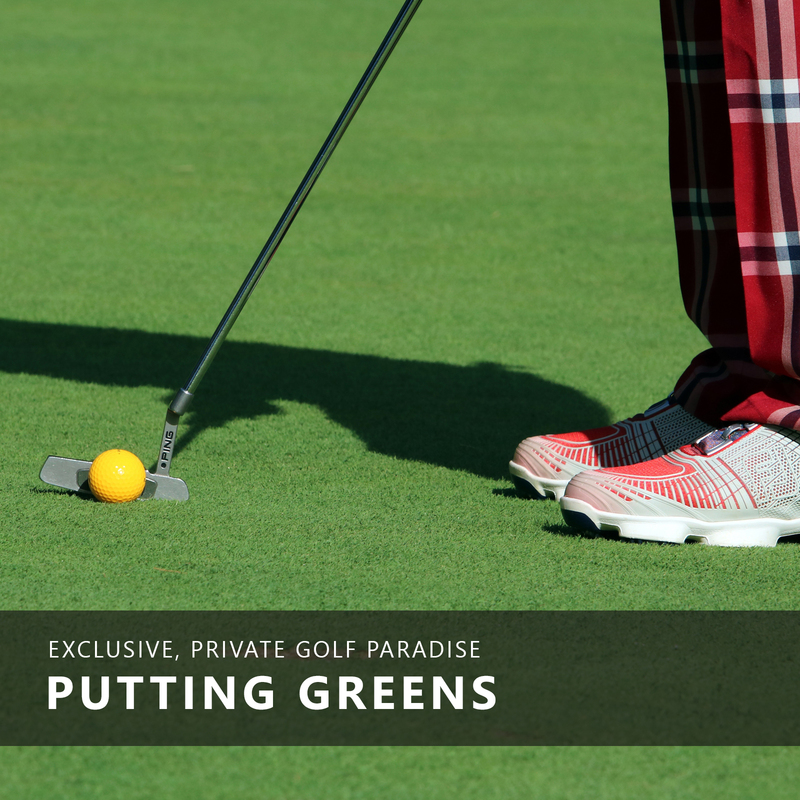 Endorsed by the two-times Masters champion Bernhard Langer, our professional greens series introduce a complete realistic golf practice in the artificial grass industry. Global Syn-Turf is endorsed by the legend of golf, Bernhard Langer. With synthetic putting greens, you will never have to leave the house to practice your game. You can prep the green, so it rolls as fast as Augusta National or as slow as the carpet in your house. Global Syn-Turf can help you develop a backyard short game green with chipping fringe, the second cut of rough, a sand bunker and a hitting mat so that you can practice every aspect of the short game. Global Syn-Turf products are the choice number 1 for professional athletes. Take it from O.J. Anderson, NFL Offensive Rookie of the Year and the MVP of Super Bowl XXV in 1991 (New York Giants). Safe, lead-free, soft, realistically looking turf is used on thousands of sports fields, sports arenas, college fields and campuses across the United States. Synthetic field turf is the smart solution compared to natural grass. Virtually maintenance free, turf required no water or fertilizers eliminating the need to expensive upkeep and water waste. With an extra-long lifespan, Global Syn-Turf's artificial grass pays for itself in a short period and increases the profitability of athletic facilities. Improve your agility drills performance, strength, balance, and coordination with Global Syn-Turf synthetic grass surfaces designed for indoor and outdoor use. Our sports field turf systems offer high performance and shock absorbency for athletes to prevent the risk of injuries and mimic the feel of real grass. Increase your speed, agility, stamina, quickness, and endurance with multi-purpose field turf created with inbuilt safety and backed-up by the best warranties in the turf industry. Our top-of-the-line high-performance sports turf is ideal for tennis courts, soccer & football fields, gym floors, aerobics, lacrosse, softball, rugby, and comes in custom colors and shapes. Most pets facilities today install Global Syn-Turf synthetic grass as an indoor and outdoor healthy and easy-to-maintain alternative pets, and dogs love. Durable resilient under heavy use, our turf products are proven to eliminate the stress associated with upkeeping pet's environments. Natural grass responds to dogs' activities with brown spots & bare patches. Quick easy fixed promised by lawn chemicals is not an option if you want your furry friends to avoid health issues. There are also rainy days when cleaning the muddy prints and trails of dirt on your hardwood floors or carpet becomes annoying. Installing synthetic lawns in the yard is the key to keeping your yard and home in good shape regardless of weather. No surprise, professional facilities for dogs and pets today prefer fake grass to traditional grass, sand, and gravel. You can use Global Syn-Turf products cut to your custom size to create indoor runners and mats that allow for walking and ensure cleanliness. 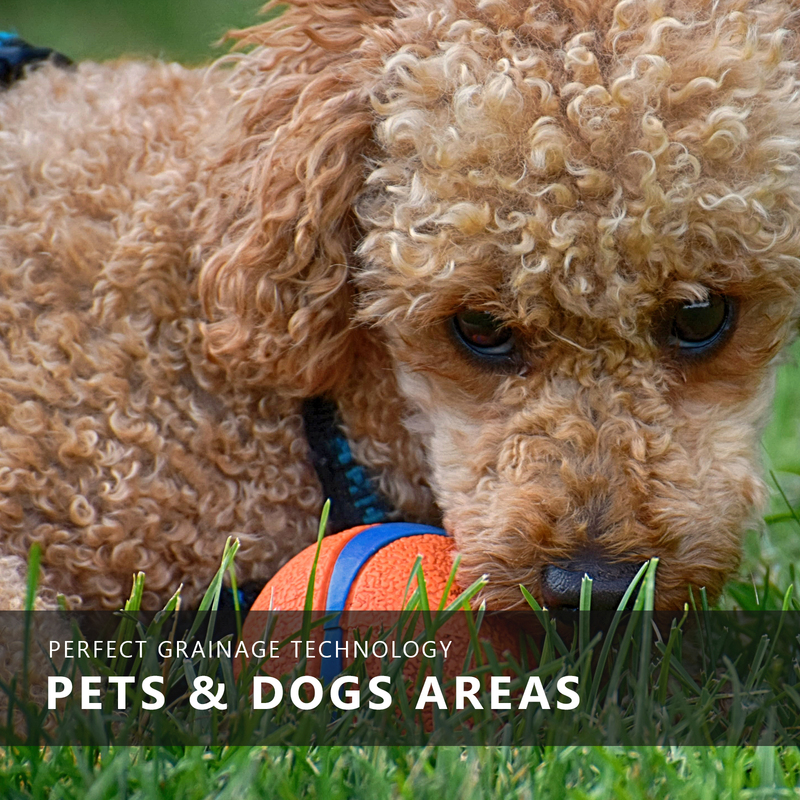 Global Syn-Turf outdoor pets systems offer superior drainage, absorption, softness, and durability. Global Syn-Turf helps to add authentic, greenery charm, softness, and comfort to any area that seemed unusable or dull before. 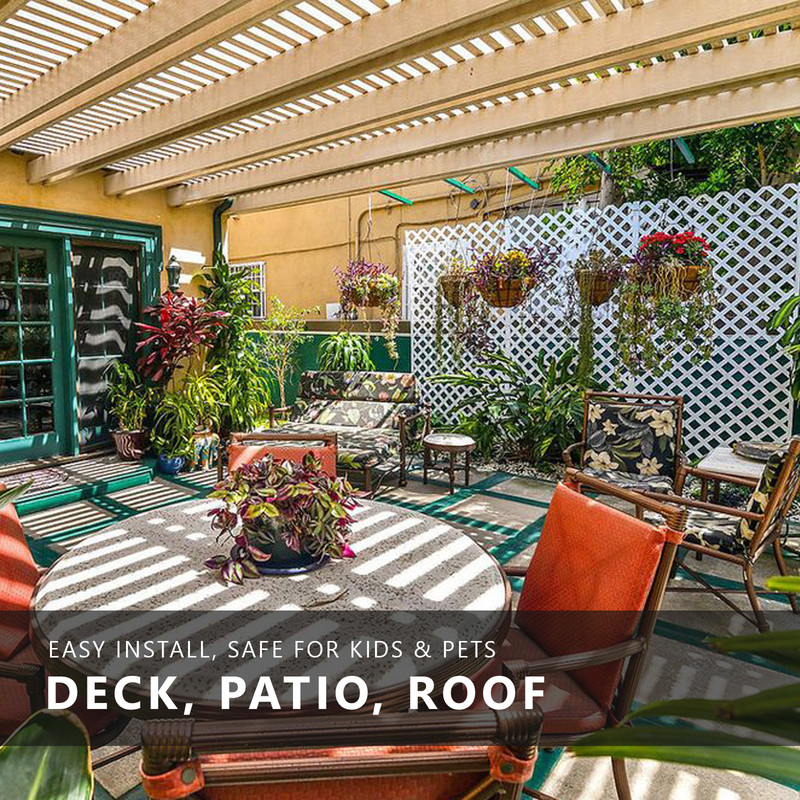 Transform your rooftop, patio, balcony, sunroom or deck into a relaxing getaway with vibrant, no-maintenance, soft to the touch grass & get the triple benefits of cozy living space and super greenhouse to entertain and play. If you enjoy spending time outdoors, but bound to stay inside a screened-in porch, you may want to brighten up space with a synthetic turf outdoor rug that perfectly fit your area, and adds natural feel and looks of a real lawn. Natural fibers that are ideal for indoor won't work outside due ti the combination of persistent moisture that makes them mildew magnets. Synthetic turf doesn't absorb water and drains right through its surface. Therefore it won't grow mold outdoors and won't be harmful to your health. Grass mats and rugs last longer than any nylon, cotton or wool, stain resistant, quick drying, durable, non-fading, resist staining, mildewing and easy to clean. It also has a much smaller carbon footprint than those of natural fibers. Our synthetic turf is made of the eco-friendly material; they have natural grass appearance and come in a variety of colors and shades, from a vibrant field and lime green, emerald, red, white or yellow. You can combine different colors with easy-seaming solutions from Global Syn-Turf to add a contemporary design touch to your deck, porch, rooftop or patio. Global Syn-Turf, Inc. is a leading manufacturer and wholesaler of high-quality artificial grass in the United States and Canada. 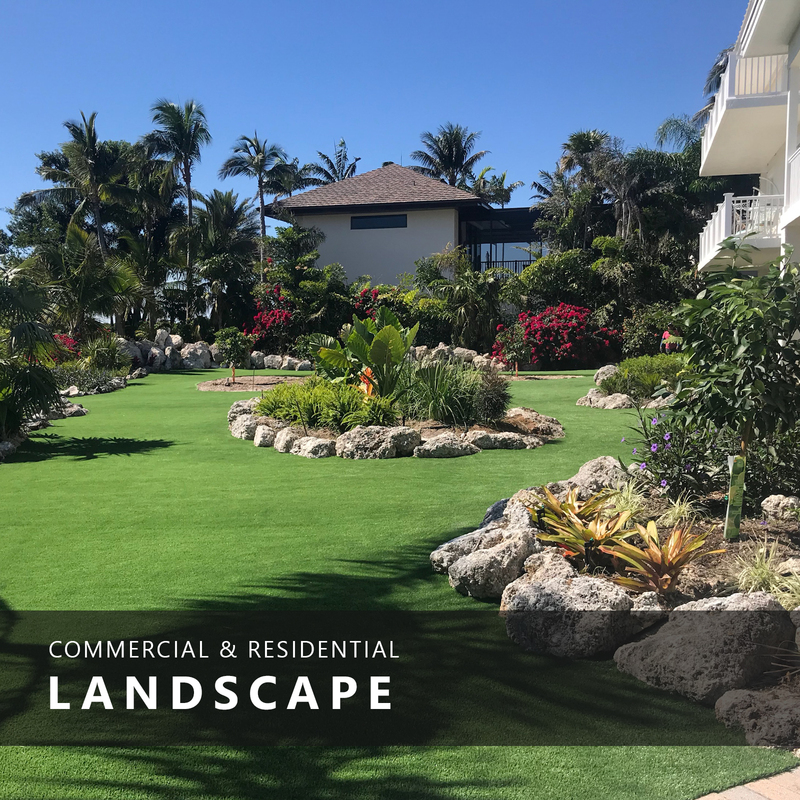 The company offers an extensive selection of products for commercial and residential landscapes, playgrounds, sports athletic fields, municipalities, golf putting greens and pet areas. Global Syn-Turf, Inc. provides innovative, environmentally friendly synthetic turf systems which require little maintenance, no water, pesticides, or fertilizers through multiple company-owned distribution centers across the United States. The state-of-the-art artificial grass offers realism, drainage, performance, safety, and durability. Global Syn-Turf is the exclusive artificial grass partner of San Francisco 49ers. Make the most of your experience with a My Global Syn-Turf account. You can save favorite items, compare products, and request a free quote online. Please, enter your email address. Please, check your mailbox for a temporary password. We sent you a confirmation email. Would you like to set up your public info now? You are all set! Please, check your mailbox for a confirmation email. © 2019 Global Syn-Turf, Inc.